Abstract: Objective To evaluate the correlations of pro-angiogenic miRNAs with risk and severity in patients with coronary artery disease (CAD).Methods After angiographic documentation, 10 patients with CAD and 10 healthy controls (HCs) were enrolled for screening the differently expressed microRNAs (DEMs) (exploration stage). Blood samples of 142 patients with CAD and 140 age-and gender-matched HCs with the same eligibility were collected (validation stage). And the plasma levels of DEMs were measured by real-time qPCR.Results In the exploration stage, miR-19a, miR-92a, miR-126, miR-130a, miR-210, miR-296, and miR-378 expression levels were higher, but miR-221 expression was lower in patients with CAD than in HCs. In the validation stage, plasma expression levels of miR-126, miR-130a, miR-210, and miR-378 were decreased in patients with CAD. Multivariate logistic regression revealed that miR-19a, miR-126, miR-130a, miR-210, and miR-378 were independent protective factors for CAD. 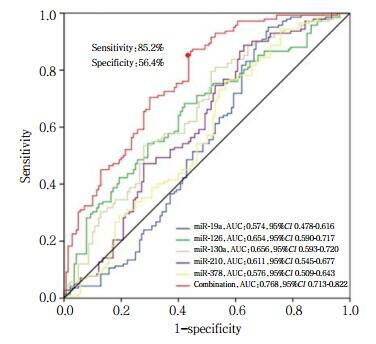 Receiver operating characteristic (ROC) analysis displayed that testing of a combination of miR-19a, miR-126, miR-130a, miR-210, and miR-378 was of good value in predicting the risk of CAD, with an AUC of 0.768. 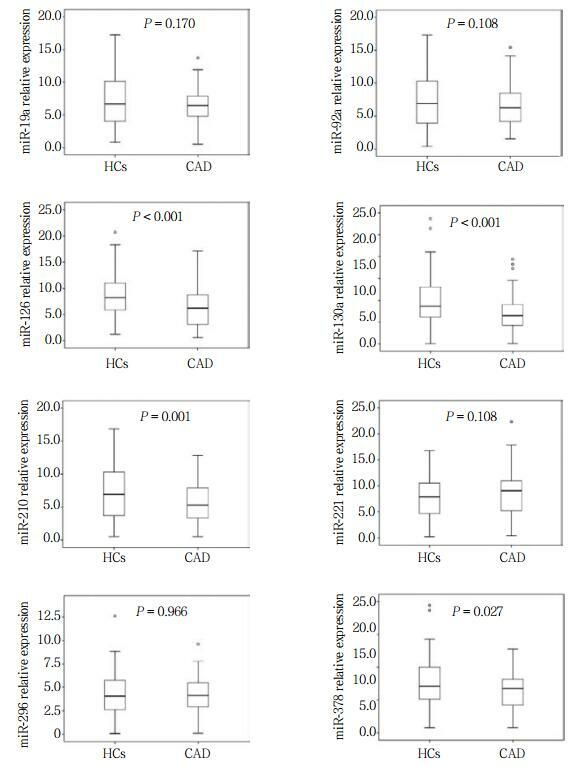 Additionally, miR-126 and miR-210 were negatively associated with Gensini scores.Conclusion miR-126, miR-130a, miR-210, and miR-378 could serve as promising biomarkers for predicting the risk and severity of CAD. Comparison was determined by Student test or Chi-square test. P < 0.05 was considered significant. Data was presented as median，quartile（1/4-3/4），mean and standard deviation. Comparison was determined by Wilcoxon rank sum test. P < 0.05 was considered significant.